Far more resonant than any other drum, the vibrasonic shells feature seven coats of a special metallic polyurethane spray, bonded to the internal part of the shell to prevent any sound from being absorbed by the wood. The shell itself is constructed of the finest Swedish 4 ply cross laminated plywood. Far more expensive than conventional ply-wood, the cross-lamination offers added strength. The Vibrasonic shell features a specially designed internal support rim allowing only the smallest possible contact with the drum head. The support rim is 8 ply, laminated individually to provide maximum support strength. The exterior of the Vibrasonic shell is also specially designed to offer the best sound and protection. The exterior material is a triple laminate of layers of Melinex and metal foil. For added protection the exterior coverings are flame resistant. 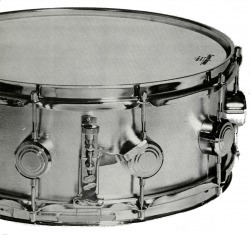 Wood shell with Vibrasonic lining with 10 brackets - incorporating triple flanged hoops - external snare strainer - 20 strand snares - heavy chrome plate. Hand Crafted British Made Drums. Manufactured in England in our own factories, Hayman Drums have become Europe's number one professional drum outfit. Acclaimed by many professional drummers to be the world's finest. Featuring their patented Vibrasonic shells, the Hayman drum has been specially designed to give maximum sound projection. Hayman drums are available in a variety of set-ups or as single drums, all of which are standard sizes utilising Remo drum heads. Perfection in precision engineering, combined with many years experience of what the drummer really needs, has brought about the biggest drum happening since the plastic head. The secret of the Hayman 'Big Sound' is in the patented Vibrasonic linings of each drum shell. The choice is yours between our new metallic finishes; Solid Silver, Gold Ingot, Midnight Blue. Matt Black or Regal Red, Iceberg (see-through) or Natural Pine. This is the outfit for professionals everywhere. The 'Big Time' show outfit for the drummer who wants the full range of drum sounds. This compact set-up is ideal for the busy session man or club work, where space is restricted. Here is the absolute ultimate in progressive percussion. It's also a 'Show-stopper' in the appearance department.